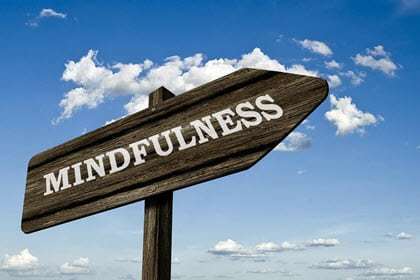 Mindfulness is an increasingly popular concept with large numbers of people taking up mindfulness techniques. But is it just a fad? Or is mindfulness something that can really help your online business, or perhaps even improve your website? The idea behind mindfulness is that you live “in the moment”, being aware of everything around you and within you. Your brain isn’t cluttered with all the worries, concerns, conflicting demands, deadlines and so on. Instead, you concentrate on that moment in time alone. Mindfulness may have become popular in the last ten years or so, but it has been practised in Buddhism for centuries. The clinical use of mindfulness was introduced into American hospitals in 1979 and is now part of therapy worldwide – even though what patients are being asked to do is not always called “mindfulness”. Whatever it is called, the techniques are well-established and used throughout the world of clinical psychology and therapy. So, mindfulness is not a fad. Indeed, it is available on the NHS. Mindfulness is an excellent tool which can be used to greatly improve your concentration, awareness and happiness. At the same time, though, it has been written and spoken about by people with poor levels of knowledge on the topic and there is a great deal of misinformation around, leading to misunderstanding. Much of this could be responsible for many business people considering mindfulness to be rather “soft” or even “woo-woo”. It isn’t; it is highly researched and used by professionals worldwide. Mindfulness is often used to describe a type of meditation. Specifically, ‘mindfulness meditation’ is a type of meditation that involves reflecting on the contents of your own mind and how they might be affecting you. Whereas the point of some forms of meditation – such as transcendental meditation – is to completely ‘empty’ your mind, the point of mindfulness is instead to simply detach yourself from your thoughts and become an observer. This way, you can prevent your thoughts from affecting you in the same way and you can also gain a greater understanding of the contents of your own mind. Next time you go into a meeting, make a phone call or start on a new project, just make a note of whether you’re focused on what you’re doing and whether you’re actively engaging in it. Or is your mind elsewhere? Are you actually worrying about work? Or are you stressing about other things? Mindfulness teaches us to be more aware of our thoughts, as that way we can decide that we’re not going to let them affect us. For instance, you may realise that your mind is thinking about the phone call you need to make this afternoon, while you are about to head into a meeting on another topic. Being aware of this allows you to refocus and avoid the stress of the two conflicting ideas being present in your mind. One good way of dealing with situations like this is to “offload” the thoughts into a notebook or make them notes in your diary. You are then aware that you have made space to deal with the thoughts later in the day, allowing you to perform better now and be less stressed. Mindfulness techniques used every day will help you become more productive, able to concentrate better and less stressed. A major issue in offices these days is email overload. This is stressing people out big time. Similarly, online meeting technology is putting people under pressure to meet tighter deadlines, thereby also increasing work-related stress. When you are less stressed, you can concentrate more easily, you can focus on what needs to be done, and you can perform better, increasing productivity. So, mindfulness has an overall general benefit for online businesses. However, there are other clear reasons for using mindfulness for an online business too. The myriad of distractions when working online can cause psychological issues. For instance, one study has found that the more time we spend on instant messaging applications, such as social media, the less we comprehend of what we are reading. That could lead to poor decision-making as a result of misunderstanding messages going back and forth in an online business. Also, mindfulness is known to help creative thinking. So, web design can be influenced by mindfulness techniques. When designing a new website or updating an existing one, using mindfulness techniques can help improve creative thought, which is vital in the highly competitive arena of websites. Mindfulness techniques will help you and your business; they should not be dismissed as mumbo-jumbo. Basic mindfulness exercises put you in a state of awareness where distractions are let go, and your mind power is able to function more effectively. They help you think more clearly and concentrate better. They are also easy exercises to do. A basic mindfulness exercise starts with sitting down, relaxing and breathing deeply through your nose. Close your eyes and be aware of your breath going in and out. After a minute, move your attention to your body, one part at a time, taking note of the sensations of temperature, pressure and anything else you identify. In a few minutes, start listening to sounds in the room, without thinking about them; just listen. When you feel right, open your eyes and look around as if you are seeing the room for the first time. Focus on anything you see for half a minute. Just look at it, but don’t question it or think about it. Then move to another object, and another, while still maintaining an awareness of your body, your breathing, and any sounds. Stay in this state of mindfulness until you are ready to get on with the rest of your work. Five-minute exercises like this, a few times throughout the day can make you much less stressed and more productive with higher levels of work performance. Being aware of your body, breath and immediate environment puts you more fully “in the moment.” Your mind is in a very receptive state, with fewer mental distractions that prevent clear thinking. Doing a mindfulness exercise before important mental tasks, such as going into a meeting, or making an important call, or writing a difficult email, will give you greater mind power, specifically more focus and concentration.